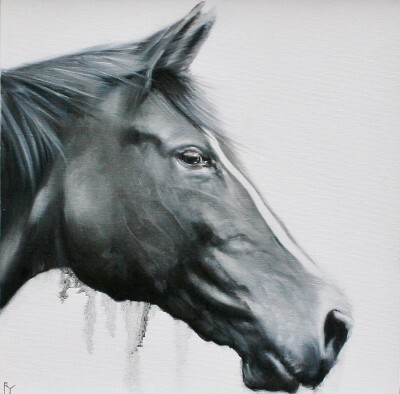 Right now we are waiting for new Robina YASMIN Art to arrive at the gallery. In the meantime, here is a selection of the artist's archived art work which has featured at Red Rag Art Gallery. If you wish to register to receive updates and alerts when new art work from Robina YASMIN arrives select this link. Robina Yasmin initially studied at the Cumbria College of Art, then Birmingham Institute of Art and Design and finally at the Glasgow School of Art. 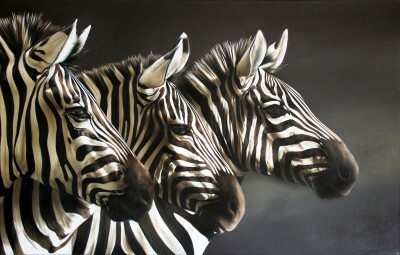 She has been painting professionally for nearly 20 years and is now established as one of the UK's leading painters of Zebras and Giraffes. 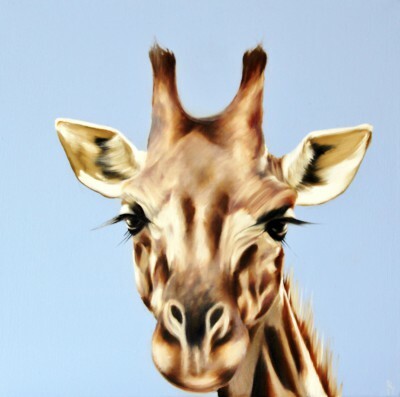 As Robina Yasmin's family come from Kenya it is understandable that an interest in African wildlife is so evident in her work. Her interest and artistic talent started at any early age. She was given a set of oil paints at seven years old and from then on she was always looking to experiment with oils as a medium or exploring her home looking for things to create with fabrics, papers, beads, leaves and other materials. Robina has always been fascinated by zebras. Her paintings take considerable time to accomplish and each is the outcome of high concentration that focuses on form, colour and especially light. Her aim is to produce contemporary art work with clean lines, strong compositions, clear backgrounds and a narrative that the viewer can relate to. 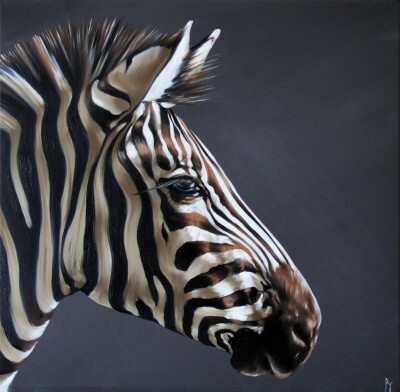 In particular she loves the way that light falls onto the black and white stripes of zebras bodies which tehn defines their forms in such a clear and direct way. Robina Yasmin is a great observer of animals. She takes hundreds of photographs and regularly visits safari parks to capture as much as detail and understanding possible. 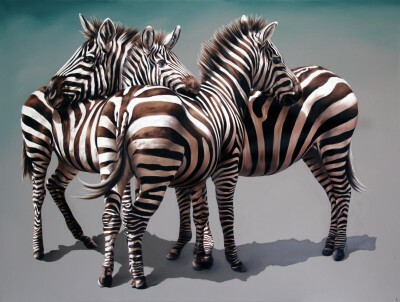 The zebras have enduring appeal to her as she studies the way they relate with one another as their characters and temperaments define the mood of a herd. Robina sees many human characteristics in these beautiful animals, particularly when there is a new born around. Often the behaviour of an animal can give rise to a title that in turn sets a painting in motion. 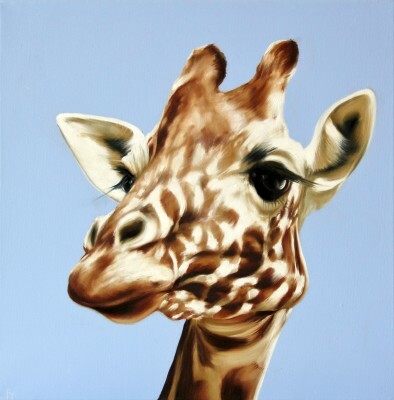 Although Robina Yasmin is particularly known as a highly collectable painter of zebras she is also know for beautiful paintings of giraffes and beach scenes. 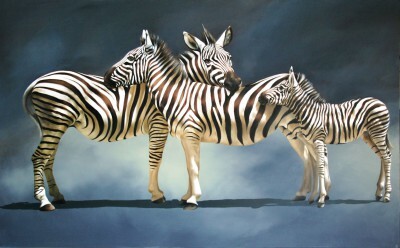 She has established herself as a painter of subjects that enthrall and uplift the viewer. With a sense of exploration Robina uses her subjects as a vehicle to record light. For it is light that inspires her the most and is so pronounced in her paintings which display such great sensitivity of observation and technique. She has developed a very distinct style and is a past finalist in the Hunting Art Prizes at the Royal College of Art and the Discerning Eye at the Mall Galleries, London. Robina's art works have also been shown at the Royal Academy Summer Exhibition. In addition to Red Rag Modern Art Gallery Robina Yasmin paintings can also been seen at other leading British art galleries. Artist Robina YASMIN is one of a growing number of artists whose modern art works feature at Red Rag Gallery in Bath. Modern art work from Robina YASMIN is regularly exhibited at the Bath art gallery which also offers an extensive choice of modern art, contemporary sculptures and collectible art prints from other present day artists. Should you wish to buy or require further information about modern art from Robina YASMIN please contact/email Red Rag Modern Art Gallery or alternatively contact Red Rag on the number below.